日本バックギャモン協会掲示板 • トピック - Backgammon Studio 4.1! Close race cubes! You are within range of 10 pips in the race. Surely you can take anything? Prime anchors! An anchor at the front of your opponent prime is a great catch! Should you make it or give it up? 8 mate! The 8 point is often a strong point to keep. Is now the time to give it up? 50 behind! You are 50+ behind in pip! Can you really take this cube? Frontline! Hit at the front of your prime possibly to prevent your opponent to anchor up there or is that a too bold move? Raceless cubes! You're 20+ behind in the race. Is there a cube here anyway? Mobile phone portrait mode support. Manual auto roll. Suggested by Jesper Carlsson and Jon Kristian Røyset. In online matches you can click on the opponent name in the header to open opponent stats. Do you want to take dialog. Suggested by Hall and others. Support for unlimited games. Suggested by Dan Wittkopp, Geir Pedersen, Kim Nordberg and possibly others! Support for playing a random track from the training track list. Suggested by Michaela Olsen. More info on what match type affects which rating and better explanation on the different match types. Suggested by Michaela Olsen. 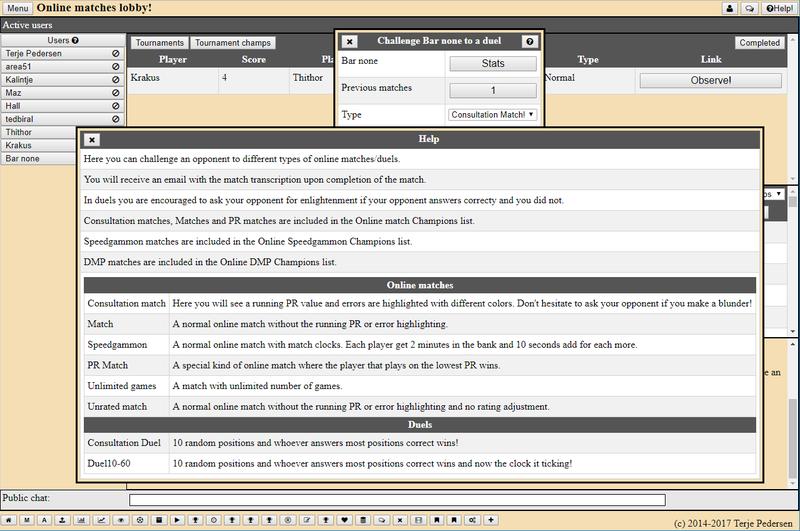 Support for tournament managers. Many interesting tournament options available! You can play pipcount without the board numbers. Suggested by Sebastiaan Kuijs. 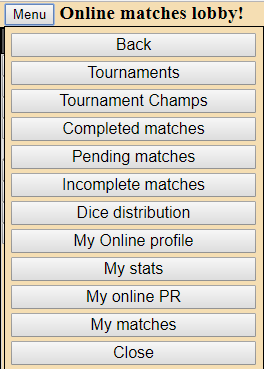 An easier way to locate your online matches from the lobby. Suggested by Sven Wisløff Nilssen. 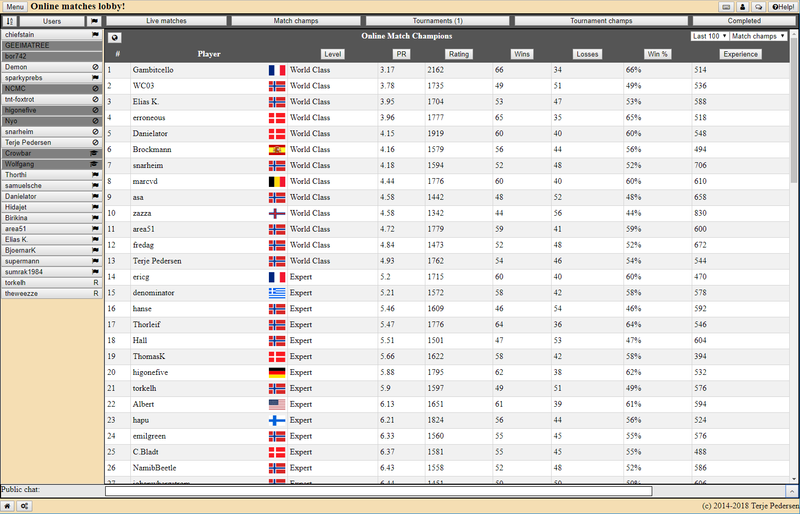 You can now check the online match performance for the last 100 matches. Suggested by Michael Krakus. It wasn't possible to enter a % sign in the chat. Reported by Maz. The clock was missing if you played a timed training track on a mobile. 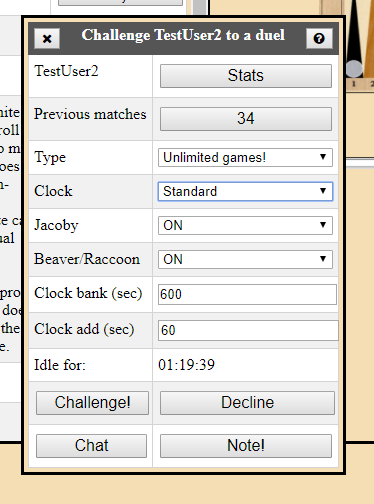 You could end up getting a 'Time ran out' dialog after having observed a match. The clock from the observed match was never removed. If you lost connection and your opponent performed a move the position will now get a forced update after you get connection again. Online matches could grind to a halt when an match email was attempted sent to a slow responding mailserver. Now this is handled separately. It wasn't possible to merge matches with an empty tournament name. You could only move it with the 'New tournament' option. Reported by Karsten Bredahl. Imported files with comma for PR in paranthesis didn't work. Reported by Karsten Bredahl. Stop the video when you close but don't pause a video dialog. Reported by Karsten Bredahl. Specifying negative number for opponent pipcount didn't work. The biggest news is perhaps the support for mobile portrait mode. Previously it wasn't supported and looked pretty bad. Now it isn't too shabby! This also means the home screen needs to learn a couple of new tricks. 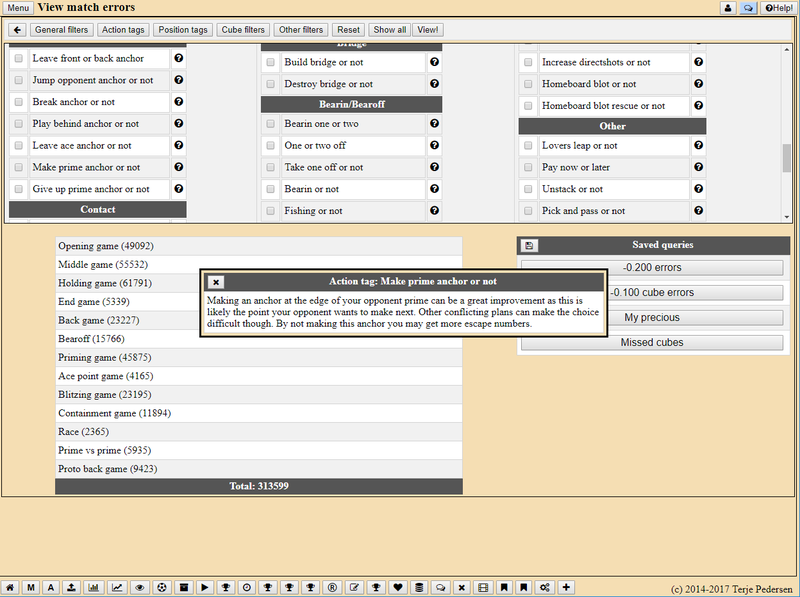 You can now specify two different layouts for the portrait and landscape mode. I used the same content in the above two pictures but you can also specify completely different ones for each mode. There is some support for other languages but it is hard to tell if the quality of the translation is any good or not. Google translate is not always spot on. Please let me know if you spot something that looks just wrong! Oh hey! More training tracks! There seems to be an unlimited amount of novel ways to make a mistake on the Backgammon Board! I keep making all of them so I'm not running out of ideas for new training tracks any time soon! 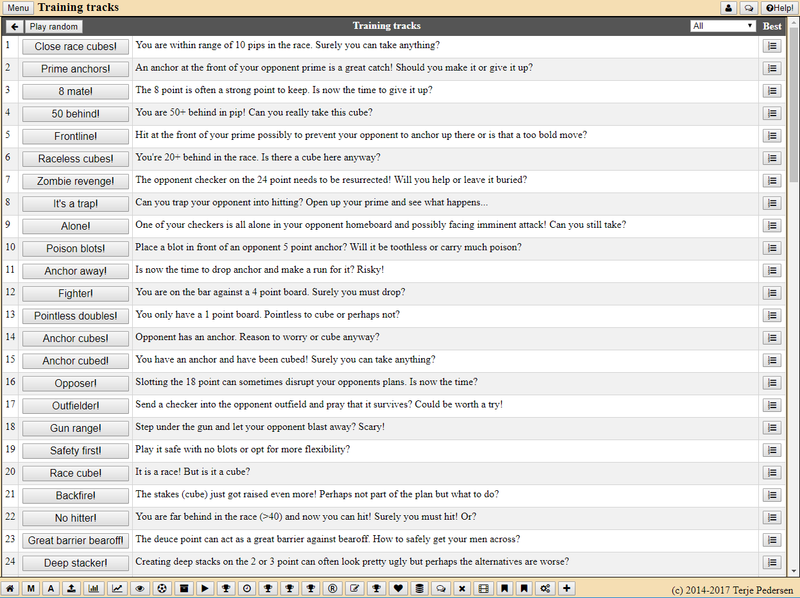 New actiontags to be used in training tracks is a must! Initially I called this golden anchors but Mary Hickey corrected me on this pointing out that this term has already been reserved for the opponent 5 point anchor. Tournament manager support! 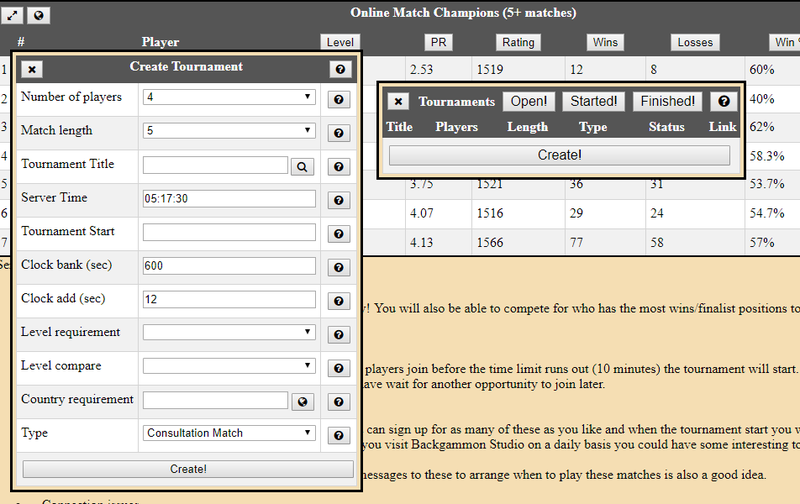 It is now possible for other users to run tournaments (Please ask me if you would like to run tournaments on Backgammon Studio). There is now an overview of the PR performance of your last 100 games. If you haven't played 100 matches you don't qualify for this list yet. I see the picture was taken before this was changed. The lobby menu now contains easy access to more online match related sections as some of them could be hard to find unless you knew where to look. There is now more info (click on the question button at the top right corner) regarding online match types. Got any questions or feedback? Don't hesitate to email me at terjepe@gmail.com. Think something sux (like the UI)? Let me know or I may just think everything is awesome! Spotted something that looks wrong? Take a screenshot and email it to me. That can help a lot in locating the problem! 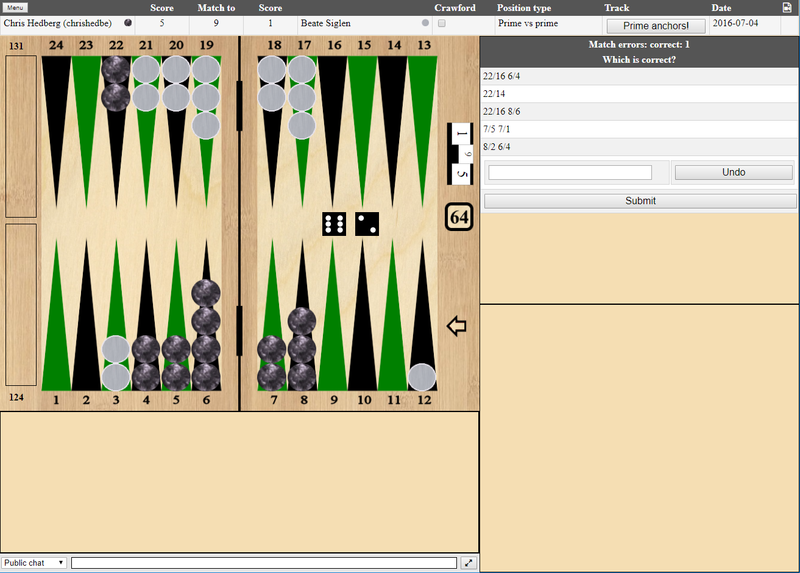 The number of online matches played on Backgammon Studio is soon reaching 10000! (Another week/week and a half or so) Haven't tried it yet? You're missing out! which is unfortunate as there is no way for me to contact this person. If you never heard anything back from Backgammon Studio please email me directly at terjepe@gmail.com and I'll help you create an account! It is worth the effort! Honest!